I’m reminded of something Nick Lander, Jancis Robinson’s husband, told me once when I complained about street names in London changing every couple of blocks. “If you don’t know how to get there,” he said, “you probably don’t have any business going.” A philosophical commentary, no doubt, on the unexamined life. A corollary in Sonoma County would be, “Decide where you want to end up before departing on any journey.” Napa, the Central Coast, and the Sierra Foothills are, more or less, long thin Regions stretched out along a central roadway. Sonoma County is different. Hwy 101 bisects it running up through the middle, but the most interesting places are well off to either side, and Hwy 101 is the least interesting way to travel between them. Think of Sonoma County as a big square divided into four smaller squares. The lower right quadrant is Sonoma Valley. That is where the town of Sonoma is located, near the southern end of the Valley, which opens onto San Pablo Bay. Sonoma Valley is very similar to, and very close to Napa Valley. The apex of the long Sonoma Valley triangle is Santa Rosa, biggest town in the County. Santa Rosa is on Hwy 101. Sonoma Valley isn’t. They just meet there. The lower left quadrant is the Santa Rosa Plain. It runs from Hwy 101 to the ocean, has long been famous for dairy farming (read cheese), and used to host a big Gravenstein apple industry. It is a cool climate growing region. It is a wonderful district if you like bucolic drives. The upper right quadrant is Northern Sonoma. It includes the town of Healdsburg, the Dry Creek Valley, and Alexander Valley (which extends from Healdsburg north along the Russian River to Cloverdale near the Mendocino County border). Northern Sonoma is a warm climate district. One is always shocked on a Summer’s afternoon to feel the temperature go up 20ºF at Healdsburg as one passes out of the Santa Rosa Plain into the Alexander Valley. The Russian River runs south for a couple miles out of Healdsburg, then takes a hard right turn to head west for the coast. There are vineyards and towns, and redwoods and retreats on the north side of the river, but for the most part that upper left quadrant is wilderness ~ 600 or 700 square miles of second- or third-generation forest, roadless cattle ranches, and hidden pot farms (not something you want to stumble onto in October ~ you’ll get shot). 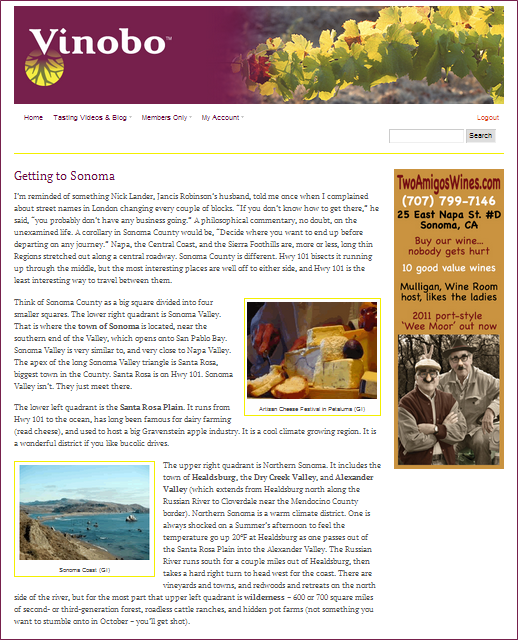 So let’s assume for the moment you want to visit Sonoma Valley. Good choice. Lots of things to see, great services, and just the right size to get your arms around in about three days. From San Francisco it’s six of one – half dozen of the other whether you: (1) travel across the Bay Bridge, then north on I-80 through the East Bay to catch Hwy 12 through southern Napa Valley into the town of Sonoma; or (2) go north across the Golden Gate Bridge to exit east on Hwy 37, then north on Hwy 121 at the Sears Point raceway into Sonoma Valley. If I were departing from Downtown or Mission Bay on the southeastern side of San Francisco, I’d take I-80 and the route via southern Napa Valley. If I were in Golden Gate Park in the northwest part of San Francisco, I’d go across the Golden Gate Bridge and go through Marin County. The point is you can spend more than half-an-hour crossing San Francisco between the two bridges. Once on either bridge, the trip to the Plaza in downtown Sonoma takes about an hour and ten minutes, without traffic. From 3:00 pm to 7:00 pm on weekdays there will be a lot of traffic. The trip then could easily take three hours. Don’t do that. It’s an enormous buzz kill. Even a 9:00 am flight from the east coast arrives in Oakland or San Francisco around noon. Catch one of those. Or catch a flight that arrives after 6:00 pm. If your plane arrives in mid-afternoon, plan on an attraction and dinner in San Francisco or Berkeley. Things could be a lot worse than the Museum of Modern Art for a couple hours, then an early dinner in San Francisco. The route over the Golden Gate Bridge and through Marin County requires a little trickiation not far from Sonoma. It is well marked. You’ll pass Viansa winery, and Cline, then Gloria Ferrer. Then you’ll hit a stop with a gas station on the left, and the Vineyards motel on the right. Take the right turn, thus avoiding having to wait at the stop. A quarter mile further on is a well worn left turn (left turn lane and everything) marked to Sonoma. Take it. You are now on the famous, but elusive Hwy 12. Don’t question from whence it came, stay on it until you run into the Plaza. Note its relationship to the Plaza, because you are going to want to find it again later. From Napa the trip to Sonoma takes about 15 minutes. Hwy 121 (the Carneros Hwy) goes west from Hwy 29 south of Napa until you turn right (at Nicholsen winery and a stop light) on Napa Road. You can take that road all the way up to it’s intersection with Broadway (second stoplight), then turn right to the Plaza. Or you can turn right on 8th St East (first light) and take that up to a T-intersection left turn on East Napa St, which will also run you to the Plaza. Note recurring Plaza theme. You may have occasion to head toward the Sonoma Valley (or vica versa) from further north in Napa Valley than the town of Napa itself. I particularly want to draw your attention to a road over the Mayacamas Mtns which departs Hwy 29 at Oakville (where it’s called the Oakville Grade) and descends with spectacular views into Sonoma Valley (where it is called Trinity Rd) a little south of Kenwood. This route is a welcome relief when traffic backs up on Hwy 29 in Napa, and it performs good educational service re vineyards (such as the legendary Monte Rosso) which lie on the Sonoma side of the mountain. Just as the Plaza at Sonoma is the physical center of Sonoma Valley, the Square at Healdsburg is the physical center of Northern Sonoma. Healdsburg, however, has come much later to the glitzy wine country party. As the crow flies, Sonoma is much, much closer to San Francisco. Before the bridges were built during the Depression, the crow would have been in a boat. Two hours from San Francisco to Sonoma Creek, met by a wagon, another hour and change to downtown Sonoma. Healdsburg would have been all that plus at least another day on horseback. But today, driving a car (crows are very bright) on the Hwy 101 freeway without traffic, a crow could get from San Francisco to Healdsburg in about an hour and a half ~ only 15 minutes longer than it takes to get to the town of Sonoma. There’s much more wine industry in Northern Sonoma: Alexander Valley, Dry Creek Valley, and all the wineries along Westside and Eastside Roads. So, in the last twenty years Healdsburg has risen rapidly within the hierarchy of wine tourism. Sonoma has its moments; Healdsburg has more of them. Coming from Calistoga in Napa Valley to Healdsburg is a choice. It’s probably a toss-up to the Square. If you actually want Geyserville, the Dry Creek Valley, or points north, take Hwy 128 out the north end of the Napa Valley, through Knight’s Valley, into Alexander Valley. At the Jimtown store stay straight on Alexander Valley Road (avoiding a right turn Hwy 128 makes toward Geyserville). Prior to the freeway make a left turn at a T-intersection onto Healdsburg Av. That’s the main drag. Call it 45 minutes Calistoga to Healdsburg. Alternatively, you may actually want a spot slightly south or west of Healdsburg proper. In which case you should take Petrified Forest Road from Hwy 29 just north of Calistoga, over the mountain to descend on Mark West Springs Road, and hit Hwy 101 right at the beginning of River Road, which goes west through the Santa Rosa Plain. To reach Healdsburg just go north a couple exits on Hwy 101. For the Square itself take the middle exit (Healdsburg Ave). Coming from the north in Mendocino is all about discretionary use of your time. Most often you will be looking to arrive swiftly. In which case you will proceed down Hwy 101, straight shot into Healdsburg: Ukiah to Hopland ~ 15 min; Hopland to Cloverdale ~ 20 min; Cloverdale to Healdsburg ~ 15 min. Note the potential diversions just south of Cloverdale on Dutcher Creek Rd to enter the north end of Dry Creek Valley most conveniently. Or the quick cut over into the middle of Dry Creek Valley on Canyon Rd, right by Geyser Peak winery. However, you may be originating in Anderson Valley, or from the Mendocino coast. A quick glance at your road map implies it is about equidistant from the town of Mendocino straight south along the coast to Jenner in Sonoma County, then east to Healdsburg, as it is through the Anderson Valley, over the mountain and south on Hwy 101. That impression is misleading. The distances may be close, but the inland route takes about two hours; the coastal route takes about eight. It’s a classic smell-the-roses conundrum. The coastal route is truly inspirational. It goes through Gualala and past Sea Ranch. The photographic study of ancient sheep fences alone is worth the trip. But it’s a long trip. You want to do it accompanied by someone with whom you enjoy conversation; someone who wants to be there. Leave the Plaza headed southwest on Broadway. Turn right on Watmaugh. Cross Arnold and continue to the T-intersection. Turn right. You are now on Hwy 116, also known as Stage Gulch Rd. Stay on Hwy 116, which involves a well-marked left turn, then a T-intersection right turn onto Lakeside Rd. Get on Hwy 101 for about 10 miles north to the Hwy 116 exit west in Cotati. Stay on Hwy 116 into Sebastopol, which is an excellent jumping off point for anywhere in the Santa Rosa Plain or the coast. Unlike most other Regions in our App, Sonoma County has a local airport which actually makes sense for convenient ingress and egress. In fact air fares and car rentals are reasonable enough to consider taking a day or two in Wine Country, driving in to a conference in Oakland or San Francisco, then returning for a final day or two in Sonoma County. Charles M. Schultz Regional Airport is named for the man who drew the Peanuts comic strip for decades while living in Santa Rosa. The airport’s logo is Snoopy flying his doghouse. There are six direct flights everyday from STS on Alaska Airlines: three throughout the day to Los Angeles; and one each to Seattle, Portland, and San Diego. Fares as of March 2013 to Los Angeles were $90 and $110 one-way depending on day, time, and advance notice. Six car rental companies have services through the airport. Schulz Regional is about half way between Santa Rosa and Healdsburg. Figure about ten minutes from either without traffic. Take Airport Blvd west from Hwy 101.